ALL SEMI PRIVATE SUITES, made up of 2 triple rooms; and 31 double rooms. 68 beds total. Move In Day is August 31st, 2019. Application deadline for 2019-2020 is June 3rd, 2019. To apply, students will click on the ‘APPLY NOW’ button at the top of the screen and complete an application. The Whitby Campus Residence will be listed as one of the Housing Preferences on the ‘Building and Room Types Preference’ page; students will rank Whitby Campus Residence as their number one choice. Residence amenities include onsite laundry, two common kitchen space, and lounge space. There will also be a Resident Advisor living on-site. Housekeeping services will be provided periodically, exact schedule is TBD. Maintenance is not on-site but is available to residents. Cable and telephone services are not available. Televisions and telephones will not be provided. Each room will include wired and wireless internet. Rooms are fully furnished (mattress size: double). 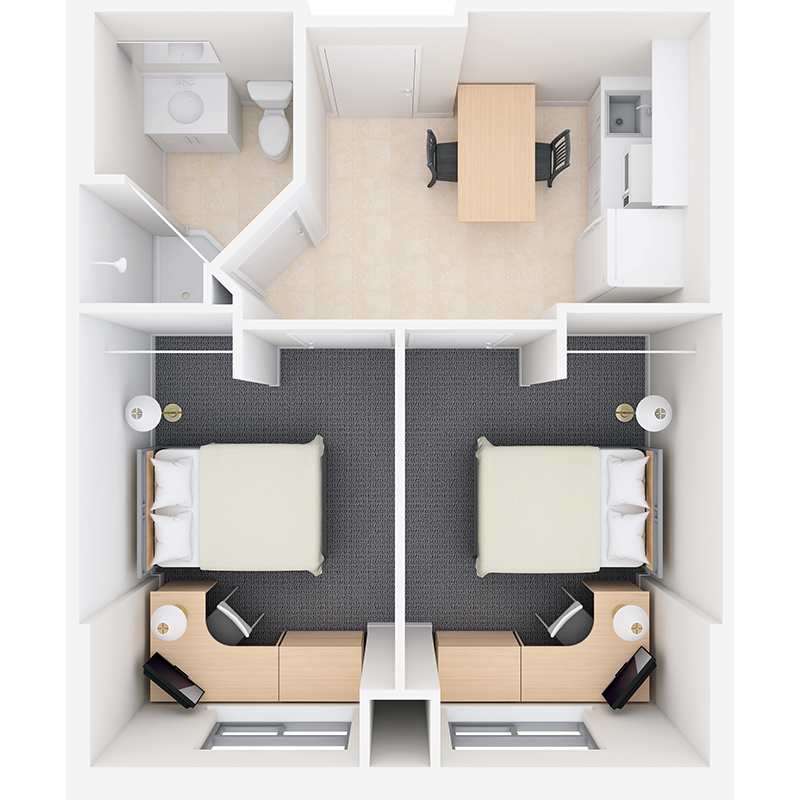 Three bedroom units will include an additional powder room within the suite, as well as a chest freezer for additional food storage. Students will be responsible for purchasing a parking pass through the Oshawa Campus parking office specifying they are residents at the Whitby Campus Residence.